Check the LSynth's base path in your MLCad.ini file. You run LSynth and see a command prompt box flash (or stay depending on computer speed) stating the following "C:\Users\(part of your username here) is not recognized as an internal or external command, operable program or batch file. The system cannot find the path specified." and also get NO Synthesis as well as the dialog box above. Possible cause - MLCad is unable to access the LSynth application folder due to a symbol (ie. @#$%^&*) in your username. Solution - Install MLCad along with LSynth onto another user account with a standard user name, create an account if needed. If it fixes the problem you can transfer all your files to the new user account. NOTE! You can NOT just change your user name in the user account settings. You need to make a change in the windows registry to change all the associated folders. Applications that are not integrated into the Windows system may need to be re-installed. ie Java Programs. How many constraints did you place? Two is the absolute minimum number. LSynth will process your file and you'll see the SYNTH SYNTHESIZED BEGIN and SYNTH SYNTHESIZED END meta statements in your file but since you didn't provide enough data no synthesis can be calculated. Were your constraints visible before you performed the synthesis? 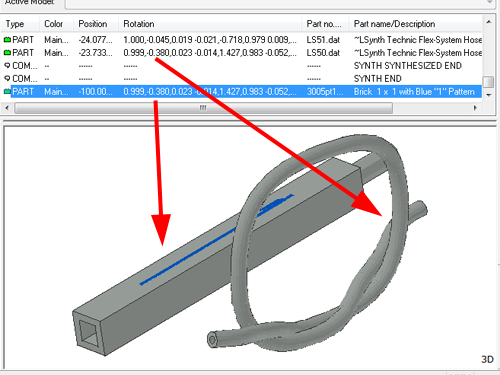 If LSynth cannot "see" your constraint parts it cannot do any maths on the path. Modifying the color in the LSynth meta command you might modified the meta itself by mistake and LSynth doesn't no longer recognize the statement. Check the order of meta command and constraints in the file parts list, especially the LSYNTH SHOW command. Band type synthesis have additional requirements to work properly: counter-clockwise order, line-up, tangent statement. 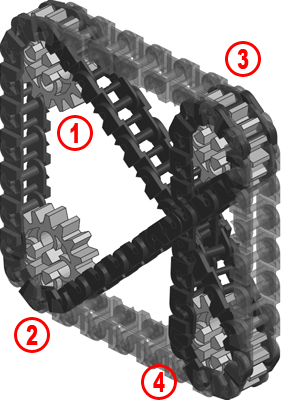 Your constraint parts are positioned to close for the type of synthesis you wanna process. I'll show you this on the TECHNIC-AXLE-FLEXIBLE which is build of two "LS40.dat - LSynth Technic Flexible Axle - End Piece" and a series of "LS41.dat - LSynth Technic Flexible Axle - Cross Section" to fill the gap. Placing the end constraints only 4 studs further away than the start constraint there is no room left for LSynth to place the cross section part in between (beside the fact that a TECHNIC-AXLE-FLEXIBLE this short doesn't exist in the real world). The LSynth.mpd file in your Lsynth bin\ folder is missing or corrupt. Download a fresh version from the tutorial page. Your LSynth.mpd file is outdated or its version is not supported by the program. Download a matching version from the tutorial page. Apparently nothing happens after you had selected File > Revert to reload a version you have saved previous processing: MLCad still shows the synthesis in the Parts List Window as well as the panes, but you cannot select them and the whole interface behaves strangely. There is nothing wrong, just MLCad a bit picky. Click on a part and select View > Refresh from the menu bar to get back to normal. Though your constraints are layed out properly your synthesis apparently follows a different order when passing through the constraints and instead of the expected transarent blue TECHNIC_PNEUMATIC_HOSE you get the solid blue version. Check the sequence of the constraint parts in the Parts List Window with Settings > Draw To Selection turned on and reorder where necessary. The order of the constraints plays a key role in band type sythesises as well. 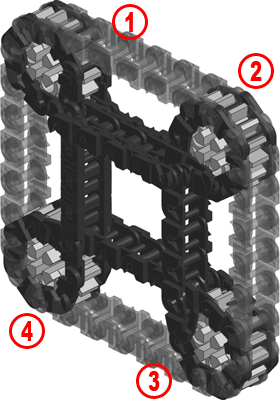 Check the order of your constraints if your TECHNIC_CHAIN_LINK looks odd. In case your hose synthesis looks contorted in the Bounding Box View your constraint parts are probably not oriented properly forcing LSynth to twist the synthesis several times to meet your requirements. In the picture above LSynth has to rotate the single cross sections gradually for a total of 180 degree to meet the flag position of the second constraint part. 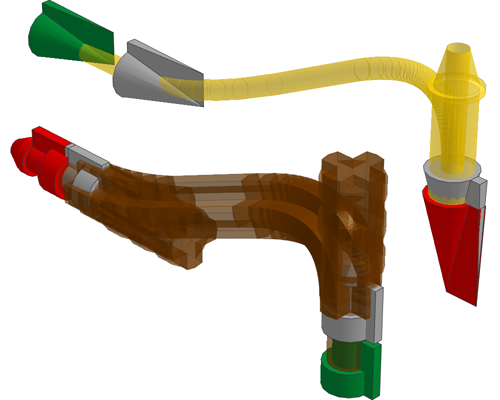 When your end pieces in synthesises like FIBER_OPTICS_CABLE or TECHNIC_AXLE_FLEXIBLE do not allign with the cross sections (or you get an enormously stretched end piece) you probably have positioned the constraints defining the pass-through to close to the end constraint. The distance between an end constraint defining the position of the synthesis' end piece and an additional constraint must be greater than the lenght of the synthesis' end piece. Synthesises using fixed leght components might have spaces in between or overlay when the start and end constraints are positioned further away than the distance defined in the synthesis. 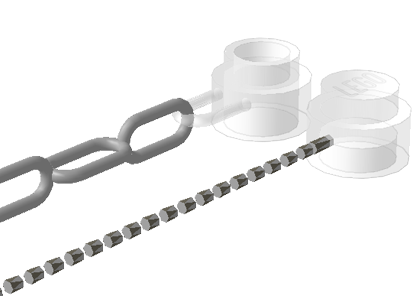 In the example above the distance between the Minifig Chain constraints is 17 studs while the STRING_11L has been stretched to 16 studs. If Same as previous has been selected in the MLCad Settings > Documents > Orientation of new object frame (accessible via the Settings > General > Change... menu), new parts added to the project will inherit the rotation from any other part selected in the Projects Parts List (above the building and viewing area with the 4 panes). If no part is selected, the new part will inherit these attributes from the very last part listed in the project as shown in the picture above. In the LDraw System of Tools rotation is calculated via a so called rotation matrix. 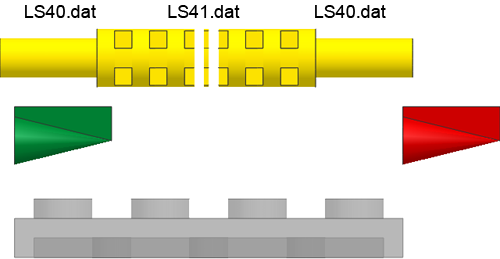 LSynth generates hoses using primitive parts rotating and stretching them and the resulting rotation matrix isn't necessarily fit for normal parts, thus causing this distortion in the new part added. Note! 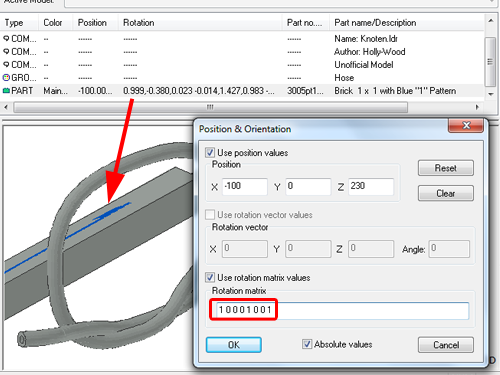 A part copied and paste in the Projects Parts List will not be affected by the above, since those parts already come with a defined rotation matrix and its values will be copied as well. Set Default in the MLCad Settings > Documents > Orientation of new object frame, before or immediately after running LSynth. Note! Not very elegant but working. Make sure the cursor in MLCad's Projects Parts List is positioned outside (above or below) the SYNTH SYNTHESIZED BEGIN and SYNTH SYNTHESIZED END meta commands before you start adding new parts. Note! It doesn't fix the problem that you by accident might select a LSynth primitive with a non-suitable rotation matrix later in the building process. Edit > Group > Group... all parts created by LSynth. This gives you the capability to move, rotate or duplicate your synthesis as any other part in the project. 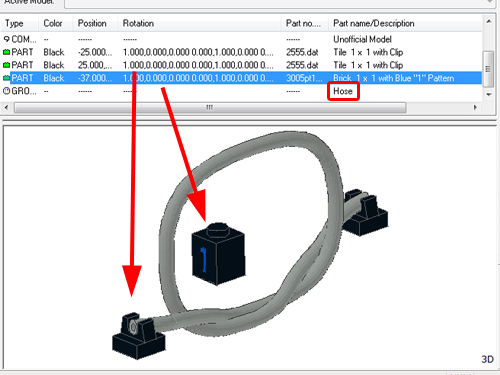 After grouping the synthesis (and getting all its parts out of the way in the Projects Parts List), just select a part in the project (it will be highlighted by a blue bar in the Projects Parts List) with a rotation appropriate for the new part as shown in the picture below. Any part outside the synthesis will do for this purpose including LSynth constraints. The new part will be inserted and listed right after the part you selected as “parent”. It is recommended to drag down the part to be the last position in the list in order for all future parts added into the project to inherit its attributes thus eliminating the “distortion”. Press OK and the part will automatically assume its default shape and size. You want the constraint parts no longer be editable but at the same time preserve the data. Just place the constraints above the SYNTH SHOW meta command and process once more. Your constraints will be converted to a "Comment".